At the Soo, July 1972. This classic Great Lakes bulk carrier was built in 1927 by American Ship Building Co. of Lorain, OH as their hull # 795. Launched February 1, 1927 and completed in March of that year, the new vessel was christened L.E. Block for Chicago's Inland Steel Company's subsidiary Inland Steamship Company. The laker takes its name from Mr. Leopold Emanuel Block born on January 13, 1869 as the oldest son of Mr. Joseph Block, founder of the Inland Steel Co. He, too, became involved with his father's company rising to chairmanship before 1920; serving in that capacity until retiring in 1940. The L.E. Block was originally powered by a 2,500 i.h.p. (1,861 kw) triple expansion steam engine with 3 coal-fired scotch boilers. In 1953, she was repowered with a Westinghouse 4,950 s.h.p. (3,684 kw) steam turbine engine built by Westinghouse Electric Corp., Pittsburgh, PA with 2 Babcock & Wilcox oil-fired water tube boilers. The power was fed to a single, geared, fixed pitch propeller. The laker's 18 hatches serviced 3 holds where the vessel could carry 15,900 tons (16,155 mt) of iron ore at a mid-summer draft of 22' 10 1/2" (6.97m). She was equipped with a diesel-powered bow thruster. The L.E. Block entered service in April, 1927 under the management of Hutchinson & Company, sailing on her maiden voyage April 14, 1927 with coal from Toledo, OH to the Inland Steel facility at Indiana Harbor, IN. She instantly became the largest vessel ever managed by Hutchinson and Co. Inland Steel Co. liquidated its subsidiary Inland Steamship Co. on April 16, 1936 assuming direct ownership of the 3 vessels in that fleet, the Joseph Block, L.E. Block and N.F. Leopold. Hutchinson and Company was retained as ship managers until the end of the 1956 navigation season. On July 13, 1936, the laker set a Great Lakes ore record with 14,651 tons (14,886 mt) from the ore docks at Superior, WI to Indiana Harbor. This record was reset on June 14, 1937 when she loaded 15,564 tons (15,814 mt) at Superior again for Indiana Harbor. She continued to set and share records with Interlake Steamship's slightly larger Harry Coulby (631' 00" / 192.33m) until World War II when changes in the Jones Act to accommodate the wartime demand for iron ore allowed Canadian boats to enter the U.S. iron ore trade. Consequently, in 1942, the Canada Steamship Lines 633' (192.94m) carrier Lemoyne set a new iron ore Great Lakes iron ore record carrying 17,253 tons (17,530 mt) from Superior, WI. The L.E. Block continued to be a contender for iron ore records until the launch of her 678' (206.65m) fleetmate Wilfred Sykes in 1949. Additional iron ore records for the carrier include 15,726 tons (15,979 mt) from Marquette, MI to Indiana Harbor on August 2, 1938 and 15,778 tons (16,031 mt) from Superior to Indiana Harbor on July 22, 1939. The L.E. Block had only a couple of incidents during her career serious enough to be noted. While backing from the loading dock at Escanaba, MI with a load of iron ore for Indiana Harbor, the vessel grounded near the outer end of the dock causing damage to some bottom and bilge plates to the sum of $19,311.47. On November 26, 1942, she ran aground in the Straits of Mackinac during a snow storm with no noted damages. The L.E. Block remained in active service for Inland Steel until laying up in Milwaukee, WI on October 30, 1981. 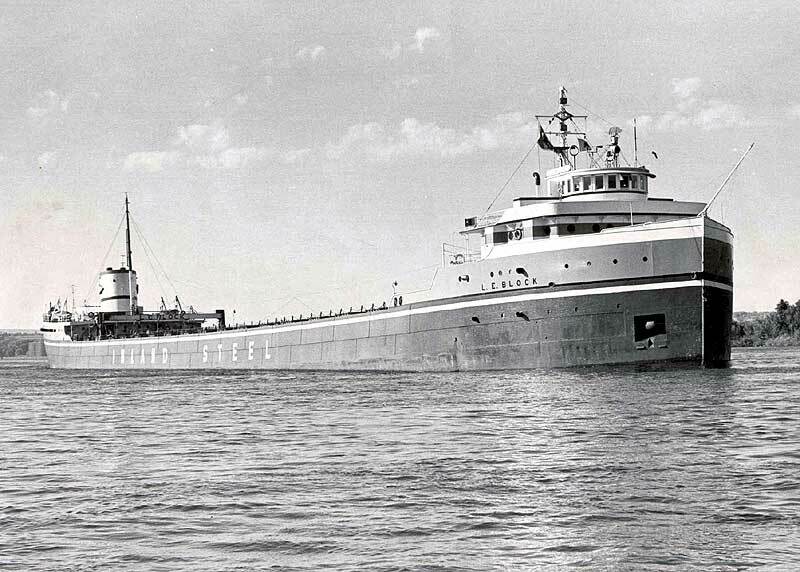 The laker remained in Milwaukee until she was sold to Basic Marine Inc. of Escanaba, MI and towed from Milwaukee on November 11, 1986 to Escanaba by tugs Daryl C. Hannah and Carla Anne Selvick. In August of 1987, she was towed to Lake Calumet (Chicago, IL) to be used as a storage hull for cement. After receiving some hull damage, the laker was towed back to Escanaba in October of 1988 by the tug Chippewa. The L.E. Block remained in Escanaba under the ownership of Basic Marine until she was purchased for scrap June 29, 2006 by International Marine Salvage of Port Colborne, ON. In the early hours of July 9, 2006, the L.E. Block left Escanaba under tow of Gaelic Tugboat Company's tug Shannon bound for Port Colborne. The "dead ship" tow passed downbound the St. Clair River, Lake St. Clair and Detroit River on July 9 assisted by Shannon's fleetmate Carolyn Hoey on the stern. The Shannon and her tow arrived at Port Colborne on July 10 with the L.E. Block secured at its final destination slip with the assistance of Nadro tugs Vac and Seahound. 1972 - 1976 P. J. MacMahon Jr. In ice at the Soo, 1970. Laid up at Escanaba, MI, fall 2005. 2 views at Escanaba, Nov.12, 2005. L.E. Block scrap tow photo gallery.